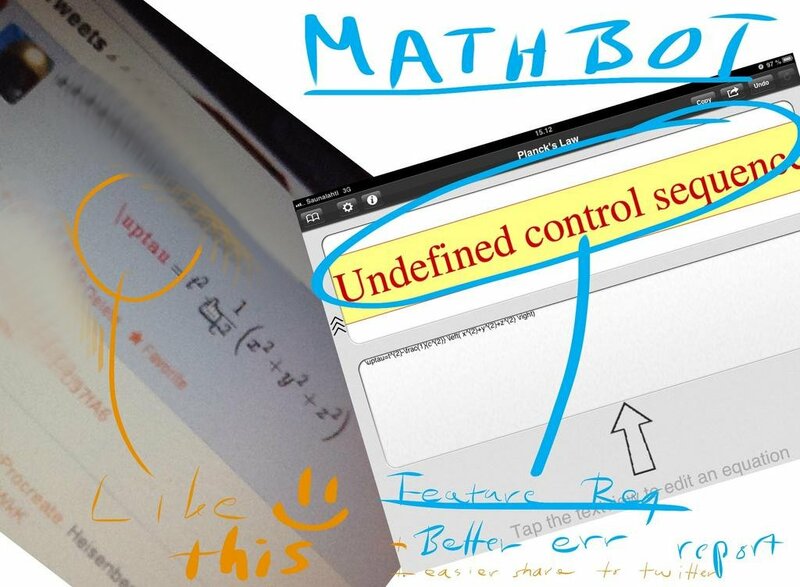 I have tried to find LaTeX -debugger in places such as iPad's MathBot but MathJax is pretty much the best tool as you can see below and particularly this script here but the tool is only for ready outputs, I press it and it will display in red if something wrong. I would be very happy if I found some tool that put my equation to red in points where I may have error, does such debugging TeX -tool exist? Similar to what I wrote in Help me to write Long LaTeX equations fast with colours and possibly with other aids, and what others have wrote here, the only way to debug these really is to break them down and re write them in a clearer manner. This particular error usually means that the curly braces are not matched. So the next thing I do is to use a feature that I think is available in most LaTeX Editors/IDEs (I know it is in TeXShop and TeXworks), and click on the opening curly brace to get to locate the matching closing curly brace. So, all that is now left are the cosmetic aspects. The integral sign seems rather small. So you can either load the bigints package as per Big integral sign, but I found the results better with \mathlarger. Also, not sure why you have braces around the (t), but I left them as is. Your forgot to close the square root command \sqrt. I don't know if there is a tool that will do exactly what you desire. Perhaps it is not even possible to have such a tool for the general case (LaTeX being a macro language etc). Having a decent editor with a good LaTeX plugin is a good step in this direction though (colors, highlighting closing braces etc). Apart from that, it is also helpful to use multiple lines instead of a single long one. Indentation too. This way, you can always comment out a single line at a time. This always helps in pinpointing the error. Look how much more readable your code can be. Another technique that I find useful is working in chunks, or more accurately writing the command first and filling the arguments later. E.g. Defining custom commands also can be very helpful. E.g. Not the answer you're looking for? Browse other questions tagged tools debugging or ask your own question. Is there an addon for thunderbird to render LaTeX equations on display? How can I debug this problem with math typesetting? Does something like a fast LaTeX syntax checker for checking errors / warnings exist? Splitting macros to individual tokens/characters, with catcode (to debug conditionals)?